A musical by Clarke Peters Featuring Louis Jordan's greatest hits Presented by Underbelly in association with Cameron Mackintosh A major new production of the hit West End and Broadway musical, Five Guys Named Moe Five Guys Named Moe features the toe-tapping and irresistible hits of jazz legend Louis Jordan, including; Early In The Morning, Choo Choo Ch'Boogie and Saturday Night Fish Fry, plus many more performed on stage by a live band. First seen at the Theatre Royal Stratford East in 1990, from where it subsequently transferred to the West End winning the Olivier award for Best Entertainment, this musical tells the story of Nomax. 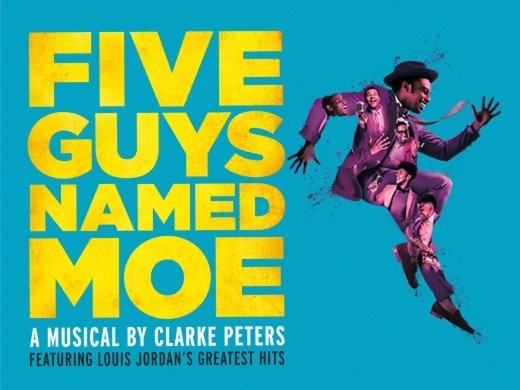 Newly single and broke, he finds solace in the Five Guys Named Moe (Big Moe, Four Eyed Moe, Eat Moe, No Moe and Little Moe), who emerge to rouse him from his misfortunes with a whole lot of soul, music and infectious energy! No exchange or refund after purchase. Fabulous feel good show! Cast are brilliant, try not to miss this one! Even though the seats weren't the best, we still had a great time. 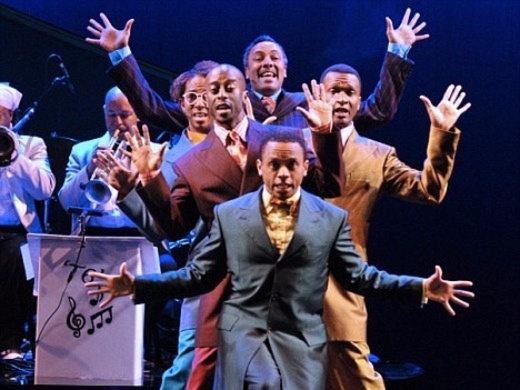 The show is a mixture of comedy, songs, and dance. The actors are very talented and make sure the audience get engaged and enjoy the show. Fantastic show...clever, witty - fantastic entertainment. A great thing to fit in over the Christmas period. Super music and energetic dancing. Great show, full of colour and joy. We had great seats as well. What a show!!!! It had me laughing and clapping for 2 hours. Fantastic talent. This was such an amazing show, the guys worked so hard and the music and singing was brilliant. This show was wonderful, I had seen the musical before and loved the music but this production and the innovative staging was such fun and so engaging . I would encourage everyone to go and see it. Great fun. The five guys are a delight. Great music and dance, my teenage sons loved it. Awesome show! Great singers and dancers! Fantastic music! Wonderful show. Such energy and talent in dancing and singing. Very well staged. This is one show not to miss, for me it had everything - colour, talent, theatre, humour, signing, dancing (swing and tap) and of course the all important music and live band, a rotating stage and a palpable WOW factor - just go, you will not be disappointed!!! Saw this show on Saturday decided fairly late to get tickets and so glad we did it was a great fun show from start to finish the actors were brilliant and full of energy I can highly recommend it !! Such energetic, joyful singing, music and dance! If you want a good night out with friends...to get the xmas party started...go. They will have you dancing! Hard to think of a performance that could match the energy, vibrancy and sheer raw talent of Five Guys Named Moe. Fantastic set design, very talented vocalists, terrific musical talent are all very much a given here, but you will find yourself regularly surprised as the cast exceed your expectations in more ways than one. Very engaging, and worth every penny... I would stress this is a performance that would be a shame to miss, you won't find the same experience elsewhere. I'm honestly tempted to see it a second time. Bravo! This is a great show. Great cast, good fun and really great singers. I wouldn't hesitate to recommend this as a fabulous night out. Couldn't get the songs out of my head. Enjoyable, interactive, uplifting and the guys did a great job. Thoroughly entertaining. 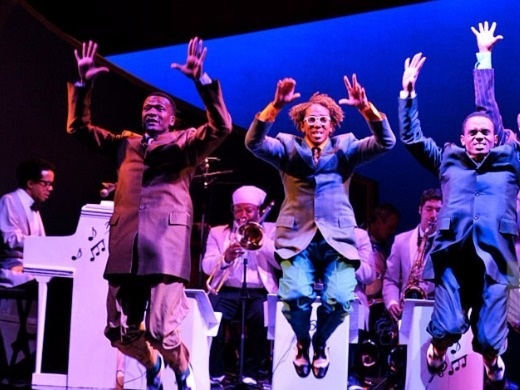 "Revival of Clarke Peters' popular musical delivers a feel-good blast along with some dodgy sexual politics"
"this is a tremendous show – wild, colourful and fearsomely feelgood"